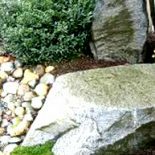 PURPOSES: Decorative rocks are a beautiful way to bring nature into your home, or to enhance the landscape surrounding it. Rocks add color, texture and interest to any space. You may be a collector, intending to display your specimens in an attractive way; a gardener, seeking a focal point in the landscape; or an architect, employing the beauty of natural stone on a wall, hearth or floor. Whatever the case, decorative rocks will help. Chips ‘n’ Dust are used for driveways this pacts very well. Used on good foundations pacts almost exactly like concrete. Chips and no Dust is almost like Chips ‘n’ Dust but without the dust the chips are bit bigger and harder to pact together. Decorative White Rock can be used as an accent for a variety of landscape features including dry creek beds and walk ways. This type of rock comes from two different sources. Actual rivers and dried river beds or glacial till which means the rock is dug up and screened from dirt. River rock has mostly smoothed edges. You will find some broken edges, some varieties have more than others. Some varieties are more round and smooth (consistent shapes) while others can be smooth with inconsistent shapes. Each one has a variety of color but has it’s own color tone and size ranges. Rock gardens can be fun, whimsical, and creative. You can build a rock garden that will also serve as a drainage system for your lawn. A dry creek bed will make the perfect rock garden and also keep water from clogging the soil in your yard. Build the drainage system at the bottom of a slope and dig a small trench. You can decorate the trench with rocks as well. Pea gravel is a type of small, smooth stone used in landscaping, gardening and outdoor construction. Pea gravel is most often used as a landscaping element to accent perimeters of garden and lawn areas. It is also a filler material used in between stepping stones on a landscaped walkway. Pea gravel can also be used to form a driveway, and as a drainage element for potted plants and flower beds. If you do not like traditional landscaping, you can try a rock garden. They are inexpensive and easy to set up. You will have to weed, but that’s about it. Many people who do not want a lawn that they have to take care of every day will create large rock gardens. They are decorative and functional at the same time. Wood Splitting - $75 for the first hour and $60 per hour after the initial first hour. ($125 minimum).